With yesterday’s leak of a possible Colorado Avalanche Stadium Series jersey, we have something to work with in determining what the Red Wings might wear when the two teams meet at Denver’s Coors Field next February. Unlike the Winter Classic, the Stadium Series is typically not the NHL’s stage for throwback sweaters. Last season, the Los Angeles Kings and San Jose Sharks wore two-toned monstrosities with giant sleeve numbers. The previous year we saw six of seven teams clad in jerseys that featured “chromified” logos, diagonal striping, contrasting-color shoulder yokes, and extra-tall numbers on the back. Only the New Jersey Devils bucked the trend, opting instead to wear their jerseys from the 1980s, which they have taken to wearing as an unofficial alternate in recent years. Detroit has no such unofficial alternate to fall back on. I think it’s unlikely that we’ll see another color-on-color matchup as we did in the 2014 Winter Classic, so with the Avalanche in blue at home I think we can rule out the Red Wings breaking out their red jerseys from that game. 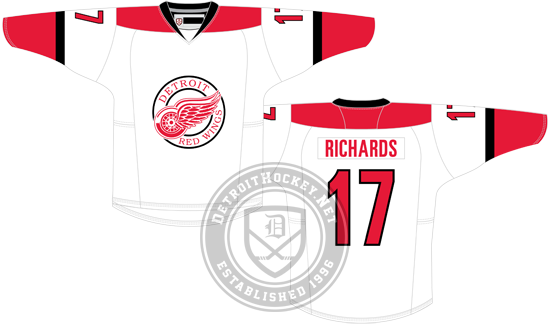 Detroit could throw back to their primarily-white 2009 Winter Classic jerseys or their 1991-92 throwback set but I think we can count on the Stadium Series template trend continuing and the Wings going along with it. With that in mind, here are a few ideas for how the Red Wings could look on February 27th. My first concept is the most conservative. The white on the Avalanche design becomes red and the colored areas become white (aside from the collar), leading to a primarily white jersey with thin red stripes on the sleeves, a red shoulder yoke (the shape of the yoke is only different from the posted Avalanche design because I used a different template), and a red collar. We don’t know the number/lettering styles but this design has me thinking something like Team Canada or the Carolina Hurricanes so I ran with that. Colorado appears to be rolling with a new logo for their Stadium Series jersey, a modernization of the Colorado Rockies’ logo of the 1980s. I don’t think we’ll see the Red Wings modify the Winged Wheel but they could use it in a couple different ways, one of which is as-is. This much white on the jersey screams “practice jersey” to me but it could also be taken as a bit of a throwback, as it comes across as a modernization of the white jerseys the Red Wings wore from 1934 to 1961. Another conservative idea makes the red not just a stripe on the sleeve but extended all the way to the cuff (taking the place of both the white stripe and the burgundy area of the sleeve in the Avalanche design). This helps break up the big mass of white on the jersey (though I think a hem stripe would do a better job of that, as appeared on the aforementioned 1934-1961 sweaters). The crest should be familiar as it comes from one of my Winter Classic concepts. The modern Winged Wheel is placed under an arched “Detroit” in a block font, based on the 1928-29 Detroit Cougars jerseys (an element also used in the 2014 Winter Classic jerseys, with a “fancy” font and a retro Winged Wheel), so once again we get a little bit of a throwback element in an otherwise modern uniform. The template seems made for at least three colors, so a break from tradition could see the Red Wings add black to their sweater for the first time in team history (ignore the black outline commonly shown on the Detroit Falcons’ wordmark, that’s wrong). Here we have red trimmed in black. I don’t like this idea at all but I could see the Red Wings taking the opportunity to finally do it, hiding behind the idea of being forced to by the three-color constraints of the template. And there’s something that feels appropriate about having what comes across as a 1990s roller hockey jersey in use in Denver. For the logo, I break out another idea from my Winter Classic concepts, including the Winged Wheel in a roundel. With the Avs’ crest featuring one of their current logos inside a geometric shape, I could see something similar going on for Detroit. Again, not saying they should, just saying I could see it. Much as with my Winter Classic concepts, I have no advance knowledge of what the Red Wings will wear for this game, I’m just looking at trends and working from there. I did the same thing looking at the Grand Rapids Griffins’ fan-submitted jersey concepts last summer and both of the ones they picked ended up being from my top ten. That said, it’s entirely possible the Red Wings buck the trend or the NHL doesn’t do templates or Detroit wears red on the road or I’m just wrong on all accounts. Next Next post: Griffins to Change Logo?